Film, media, and entertainment industries are using AI and machine learning technologies to enhance and change the way that entertainment is produced, developed, and delivered. 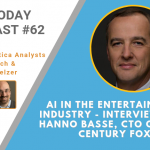 In this Cognilytica AI Today podcast, hear from Hanno Basse, Chief Technology Officer of 20th Century Fox Film Corp about how AI, machine learning, and cognitive technologies are forever changing the way that entertainment is being brought to the masses. 85 episodes available. A new episode about every 6 days averaging 21 mins duration .